Exit question – would we expect the prophet Elijah to attend a worship ceremony populated with Baal worshippers? Oh, wait… he did do that (1 Kings 18). Might I suggest that the NASB translators are being too polite in the above text. When Elijah said “…either he is occupied or gone aside…” it doesn’t exactly reveal the intensity of Elijah’s mockery. The verbs employed by Elijah rhyme quite well, and connote a symmetry of thought: siych…siyg. Siych speaks of heavy contemplation, and siyg speaks of a person undergoing a bowel movement (The Dictionary of Biblical Languages with Semantic Domains). 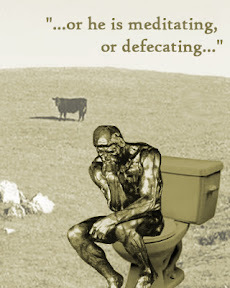 If you take Auguste Rodin’s sculpture “The Thinker” and put him on a toilet – then you’ve approximated, in picture form, Elijah’s rebuke of their idolatry. Clearly, Elijah was no ecumenist, nor pluralist; he was a prophet of God who was filled with a holy indignation against the idolatry of Baal. Who knows, perhaps Warren is preparing for such a public renunciation of Allah at his next Ramadan gathering – although, I’d rather doubt it. After renaming Jesus as “Isa” at our President’s inauguration, we are left with little grounds for a better hope. If you think that using the Koran’s name of “Isa” for Jesus isn’t a problem, then just remember this: according to the Koran, Jesus was not the Son of God, nor was He ever crucified. Why would we desire to render indifference to such heresy as this, any more than we might with, say…. Mormons or Jehovah Witnesses?